Running Tips made Better. All Practical Guide on Running. Stretching,Program,Treadmill Running and more. Welcome. Running Tips, From Injuries To Running Program To Treadmill Running And Stretching..
"The Running Tips On The Small Questions That Bug The Runners Mind"
"How to I plan the perfect running program- what workouts do I use and how much is enough?" should I stretch or should I not? That is, how and why is my back, achilles and knee hurting. These things are pretty much the same for 5k runners, 10k runner or those that are half marathon or marathon training. This is the start for a page ; where you can hopefully find some answers,opinions and suggestions - a simple guide to those kind of questions. We all have the curiosity for most of the same running topics. As we learn to use our body in our daily training. About how to solve the challenges that we face as we use our body in our daily training regime. The best running tips you will find among runners themselves, not the "experts"
Much of the advice in this section is based on other runners experiences, as well as my own. You do not have to be an exercise physiologist to understand the basics ; it is so many things that actually most runners are interested in. And a number of well-established good solutions to many of these challenges. we sort of stand on the same platform. to find the answers to those very similar running problems we face. To shoot off here right from the start, the muscle cramps, the running form and more..
Is Treadmill Running As Effective As Outside Running ? This is a heavily discussed topic among runners. Sometimes you have to face the winter roads, or it is simply more convenient to run the workouts on treadmills. Treadmill running can actually be more effective than outdoors running..
Treadmill Running - and why treadmill running can be extremely effective. Should I Be Stretching After My Hard Workouts ? I say : better to find the best running shoes for you (see article about this) and you'll have a ton better injury prevention compared to stretching. Here you can find the piece on Stretching for Running. In this article you'll find tips on how to do eccentric stretches/strength to boost strength, injury prevention much more than "regular stretching"
What Elements Are Important In The "Perfect" Running Program ? Or rather, is there such thing as the perfect running program ? At the same time there as some elements that makes the running program as individual as possible - and these elements helps in injury prevention. And in optimizing the performance. and finding types of running workouts that fits you the best among the most common training type session. A few general thoughts on the running program is gathered in this little Running Program article. What Can I Do About Muscle Cramps And How To Recover The Muscles From Muscle Soreness More Effectively ? This is a big one - and can be done quite easily with such things as ice-baths and active recovery techniques. And 90 % of runners will get better just by following 4 simple steps. You can read more about these 4 steps to avoid/get rid of muscle cramps in the Running Cramps part located here. Can I Change My running Form, My Running Technique. In Case, How ? Another interesting topic - and I do believe this is possible to change ; with success but it does take time and it does take the right kind of approach. I have Hurt My Achilles, I Have This Strange Sensation In My Hamstrings. What are most likely the cause for this and other running injuries? First up is an article about hip pain, that you can read about in the menu at the far bottom of this page. Here you also find a piece on Leg Pain Running Problems - and here on on Hip Pain in Runners. Both these problems are quite common for all-level-runners. Running For Beginners, What Is it Important To Look After? Be a bit patient with me here, new articles will be added on a regular basis. The running tips articles will also be expanded further. And of course, if you have any suggestions or requests do not hesitate to make contact. Any such suggestions are greatly welcomed. In addition to all this, you may want to pay a visit to David over at tips4running.com - he provides som excellent running tips to all level runners. Wish to have a question answered ? This is the place to post it. Want to have it answered - for guaranteed ? Treadmill Workouts for 10k ? 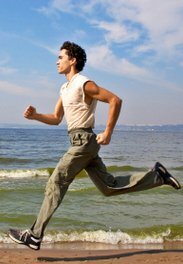 Other recommended running tips resources : TheFinalSprint.com webpage (linking out), best place for elite athlete blogs. This site sells unique customized running log books, with your photo and text on the cover. They can even include an (optional) marathon training program geared to the marathon date you choose. The training schedule (miles & type of run) is printed right on to the running log pages. Find out more here.